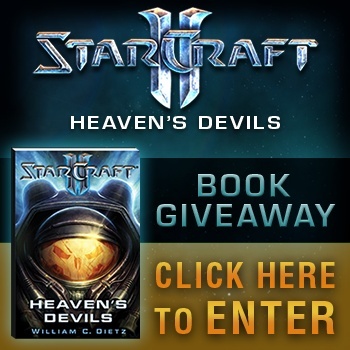 Thanks to Sneak Attack Media, we have 5 copies of StarCraft II: Heaven's Devils to give away to our awesome community. All you have to do is answer nine StarCraft II questions and you will be entered for a chance to win one of them! For the first time ever, StarCraft enthusiasts will learn the origins of the enduring friendship between the young upstart Jim Raynor and the streetwise soldier Tychus Findlay. Watch as they battle on the front lines of a fierce interplanetary war and bear witness to the Confederacy's rank corruption as it rains death and destruction upon the government's own people. Please note, you must be at least 13 years of age and be a current resident in the US or Canada to participate. To begin the quiz and enter for your chance at one of these great copies of StarCraft II: Heaven's Devils, click here or the picture to begin. Good luck!